Flags outside the UN Secretariat building. United Nations Secretary-General António Guterres today presented the Organization’s proposed programme budget for the 2018-2019 biennium, amounting to just under $5.4 billion, to the UN General Assembly’s main administrative and budget committee. The proposal (before re-costing) is about $200 million – about four per cent – below the appropriation for the current biennium, and reflects an overall net decrease of 92 posts compared to the current budget. 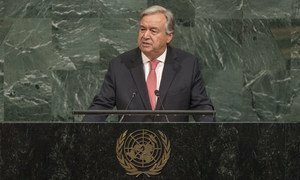 “In taking the oath of office last December, I promised to work with the Member States to reform the UN thoroughly and continuously,” Mr. Guterres told the General Assembly’s Fifth Committee. In formulating the proposal, explained the UN chief, ways to make the Organization more nimble, responsive and effective in managing its staff and resources, and in supporting its Member States were explored. An extensive review of our internal policies and administrative instructions is under way to remove duplication, reduce fragmentation and streamline procedures, he added. In his briefing to the Committee, Mr. Guterres spoke of the new UN strategy to combat sexual exploitation and abuse, strategy on gender parity, strengthening whistle-blower protection, the new counter-terrorism office and strengthening the development pillar of the Organization. As part of the reforms, the Secretary-General noted that he is delegating managerial authority to programme managers and demanding greater accountability from them for mandate delivery; proposing changes to the UN management and support structures; and proposing measures to streamline and improve the planning and budgeting processes; measures to improve his ability as the chief administrative officer to redeploy resources within parts of the budget to better support the implementation of mandates. “The reform proposals will not affect the budget proposal for the biennium 2018-2019,” he said. The UN chief also noted that for the new management structure, a breakdown of functions and a costed proposal for the two new departments in 2018 will be provided. Some of the changes will be reflected in the support account for 2018/2019, and others will be accommodated within the approved staffing table for the regular budget. The changes to the planning and budgeting cycles and documentation will come, if approved, into effect in 2020. Addressing the annual gathering of world leaders at the United Nations Headquarters, Secretary-General António Guterres today spotlighted several threats – including the nuclear peril, climate change, and ongoing conflicts – that must be overcome to create a better world for all.